The morning of my eye lift treatment, I look in the mirror before I leave home and say a not-so-fond farewell to the saggy, crinkly skin on my eyelids. At 49, I am finally going to be rid of it. Eyeliner will glide on effortlessly. I will look more awake and, of course, younger. At least, that’s the plan. And the best news of all? There’s not a scalpel in sight. This moment has been a long time coming. It’s not like I woke up one morning and thought: ‘Ugh, I hate my eyelids.’ I have hated them for a very long time. Probably about ten years. 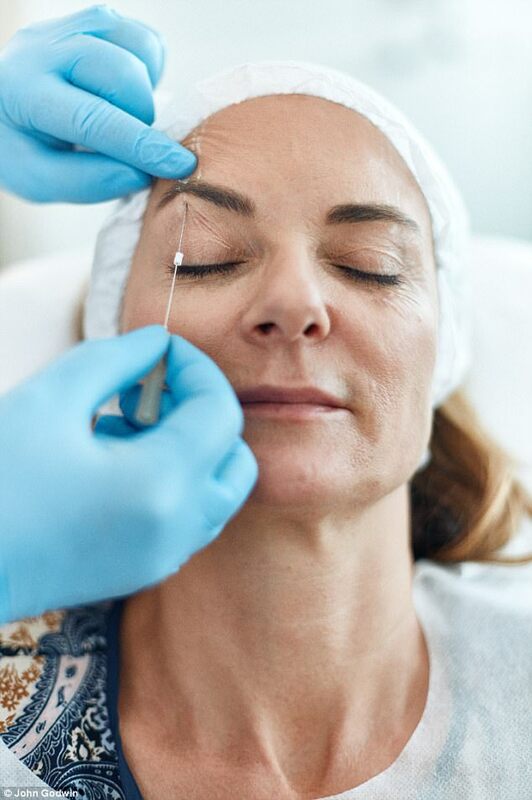 For while it is possible to keep your body in shape and to reduce wrinkles with Botox, there really is nothing you can do to hide that crinkly, loose skin that develops on your eyelids after a certain age. In fact, sometimes, it’s almost as if one’s eyelid has somehow spawned another, spare eyelid that just sits there, looking saggy and annoying, like an unwelcome guest. Around six years ago, when I was researching an article about cosmetic procedures around the world, I asked a plastic surgeon in Dubai what he would do to improve my looks. Much as I agreed with him that an eye lift was probably needed, I have vowed never to go under the knife. 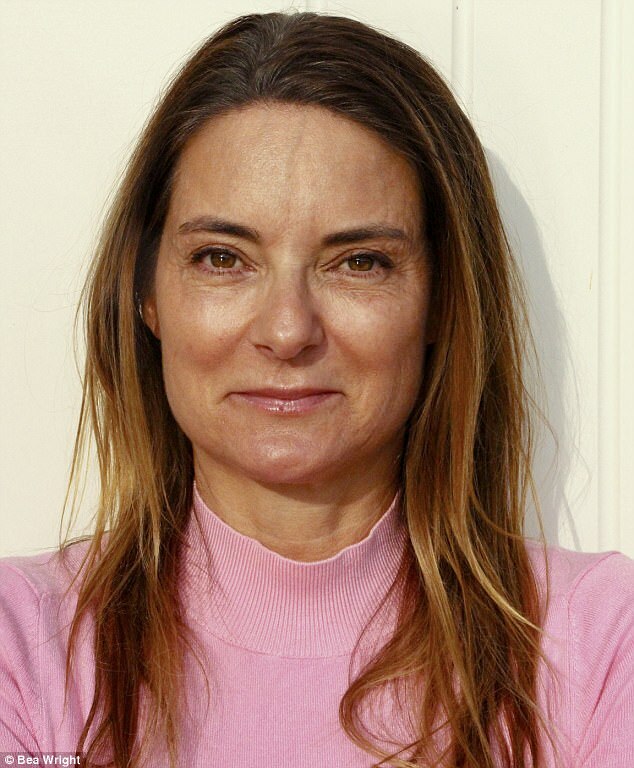 As a beauty writer, I have tried many crazy treatments, but I always said I’d draw the line at someone cutting open my face to make me look younger. There seems to me a kind of finality about the knife that is worrying. If something goes wrong, it really is permanent. And what a fool you’d look if you willingly damaged yourself in the name of vanity. 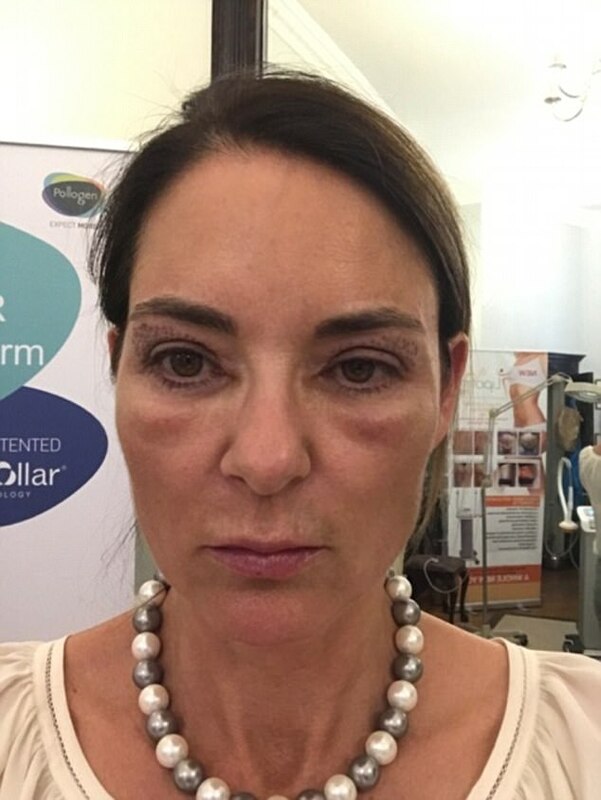 So when I heard about Dr Gabriela Mercik, who works out of Harley Street and offers a non-surgical eye lift, I was intrigued. It sounded like the solution to my eyelid problem. It is true they are by far the oldest part of my face. In retrospect, this is probably partly because I never thought to put sunscreen on them. 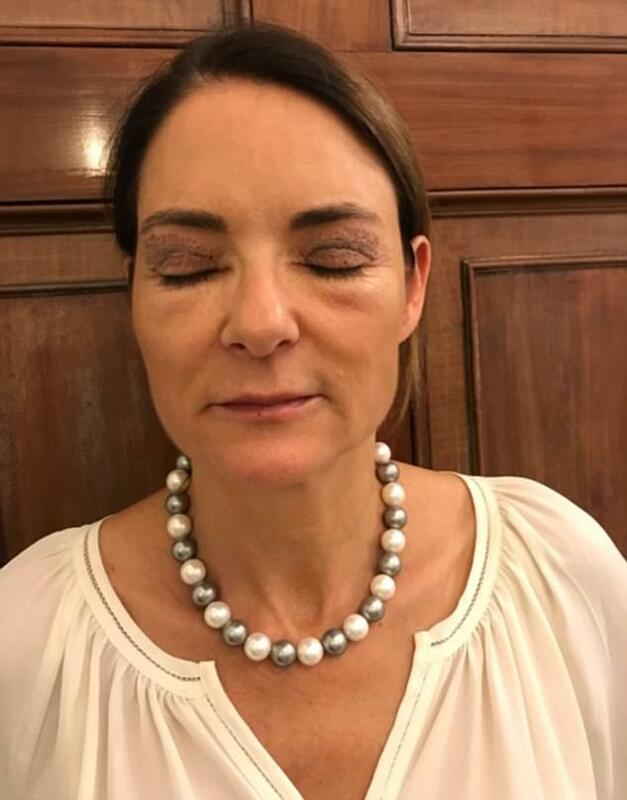 Also, according to Dr Gabriela, who asked me to demonstrate how I take off my eye make-up, it’s because I am too heavy-handed. Anyway, whatever the reason, it had got to the stage where applying eyeliner was majorly irritating due to the crinkly nature of my eyelids. In my experience, doctors always play down the length of time during which you will not be fit to be seen in public. As I would discover, this was no exception. On the day of the procedure, I arrive at the clinic and am shown to a large, reclining chair, before a nurse comes in to cleanse my face and give me a hair net. After that, my eyelids and the area around my eyes are covered in an anaesthetic cream, ‘to help with the pain’, says the nurse. My late grandmother’s mantra of ‘you have to suffer to be beautiful’ goes through my mind. She used to say it as she wrung out my hair after washing it. I am imagining this will be slightly more painful than that. I am left with the cream on to let it work for an hour or so. This is the most pleasant part by a long way. Then the treatment begins with the insertion of the threads. These literally lift your face underneath the skin by pulling it tauter. 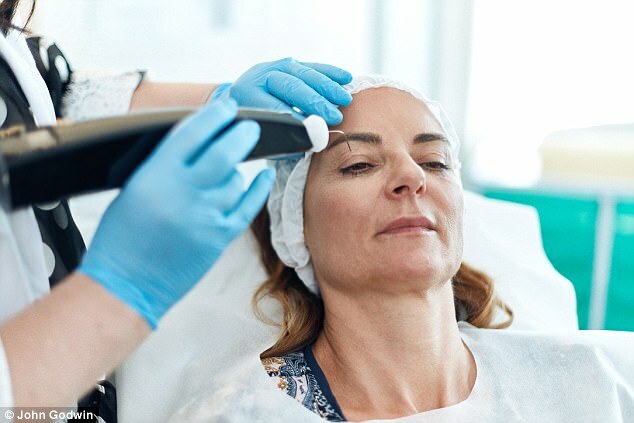 I’m glad I can’t see what’s going on as the doctor inserts a needle into the area underneath my eyes, with a thread that will apparently reduce wrinkles under my eyes as well as increase my skin’s production of collagen, the firming protein that is the holy grail of the ageing woman. Dr Gabriela twists it to secure it, knotting it into my subcutaneous fat (fat that is just beneath the skin). Having inserted some threads under my eyes, she moves on to my brow area. This part of my face is bonier, and I can feel the threads hooking in. It’s a strange sensation, and a little painful, but by no means unbearable. When she has finished one side, Dr Gabriela shows me the difference between the two. This is, of course, before any bruising has set in — and the results are impressive. The side that’s been done really does look lifted — I’ve lost five years, at least. Next up is the main part of the treatment, the so-called non-surgical blepharoplasty, which uses a wireless device with a needle that generates a small electrical charge, like a miniature lightning bolt. This stimulates the instant contraction and tightening of skin fibres, even though the tip of the needle never actually touches the skin, and doesn’t affect the area close to it, tightening loose skin on the eyelids. Until now, there has been no way to deal with excess eyelid skin that doesn’t involve a scalpel, with the associated risks, cost, pain and downtime. As Dr Gabriela says: ‘I believe it is time to stop plastic surgery for beauty reasons. 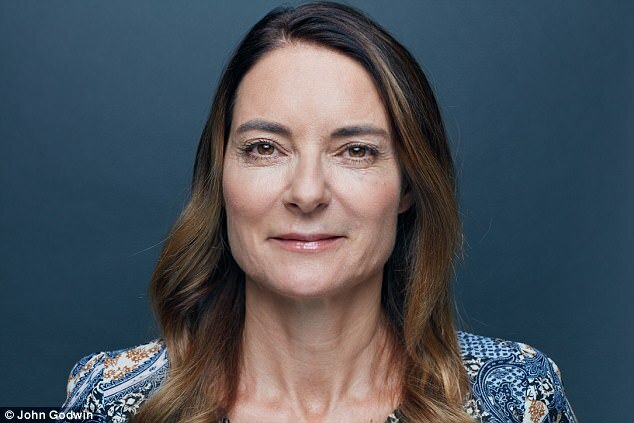 Patients’ health is a priority, so I strongly advise non-surgical procedures for any aesthetic reasons.’ But, let’s be honest, while non-surgical, this isn’t entirely pain-free. In fact, despite the anaesthetic, each zap lasts about two seconds and feels like somewhere between a cigarette burn and an electric shock. And there’s about 50 of them. On each eye. On a pain scale of one to ten, where ten is unbearable, this is six or seven. And then there’s the smell. It’s horrible — the smell of burning flesh, my burning flesh. I’m really not enjoying myself. But Dr Gabriela works steadily and quickly and, within 20 minutes, it is all over. I’m handed a mirror to see what’s happened. So far, I don’t look too nuts. Dr Gabriela has put some sunblock on my eyelids, so the tiny pinprick marks are slightly covered. From a distance, you could almost think I was wearing heavy reddish eyeshadow. 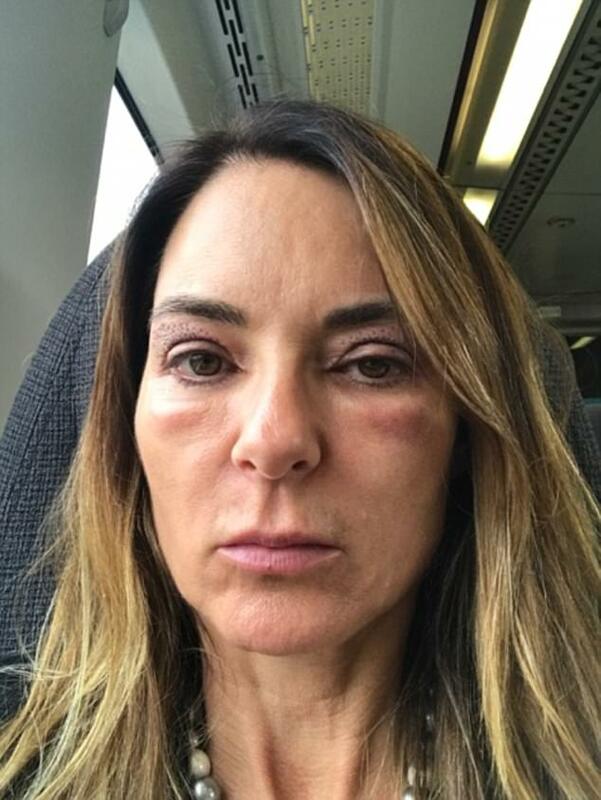 I head home with a tube of gel that will apparently help with the bruising, along with some of Dr Gabriela’s products, which I am told will encourage healing and collagen production. It feels quite sore, a bit like sunburn, so I take a paracetamol. But it isn’t until day two that I really start to look awful, like I’ve been beaten up. The skin under my eyes is swollen and bruised, and the scabs on my eyelids are really obvious. My eyelids are swollen, too. Added to which, they itch. 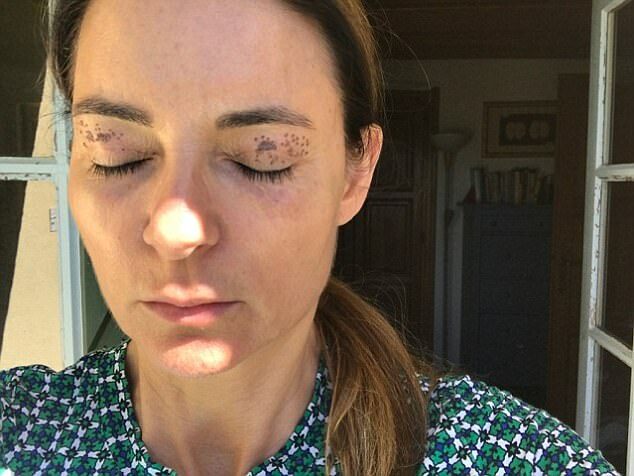 I stop myself from touching them — Dr Gabriela said the most crucial thing is not to pick the little scabs. They will leave scars unless they drop off naturally. It’s not very sunny, but as it’s June, I can get away with wearing my sunglasses. I have a few events to go to, including an anniversary party. Luckily, it’s in a marquee and the lighting is low, but I still have to explain my appearance to anyone who can see me closer up. After that, I stay in as much as possible and wait for things to improve. I bruise easily, and they tend to hang around for an age, so it’s not until a week later that I feel I can be seen in public. Admittedly, this does still compare favourably with surgery. A friend who had her eyelids done was out of action for about two months. For the first two weeks, she couldn’t do anything that might dry her eyes out, even watching TV or reading. It really was debilitating. But how do results compare? Some people have two or three goes at this treatment, at intervals of two months, before they’re satisfied. I’m sure if I did that, my eyelids would look like my teenage daughter’s. As it is, they’re vastly improved. There is much less excess skin — that spare eyelid has shrunk away — and the skin is smoother and younger-looking, especially under my eyes. On balance, I’d say it was definitely worth it, but that, for me at least, the downtime was more than I expected after a non-invasive treatment. At one point, around day five, I felt rather depressed by the state of my face and wondered if I’d finally gone too far in my quest to avoid wrinkles. But now I’m fully healed, and my eyelids are perkier, I’m very happy. Will I go for the second treatment? I’m not sure I need to. But it’s good to know I have the option.